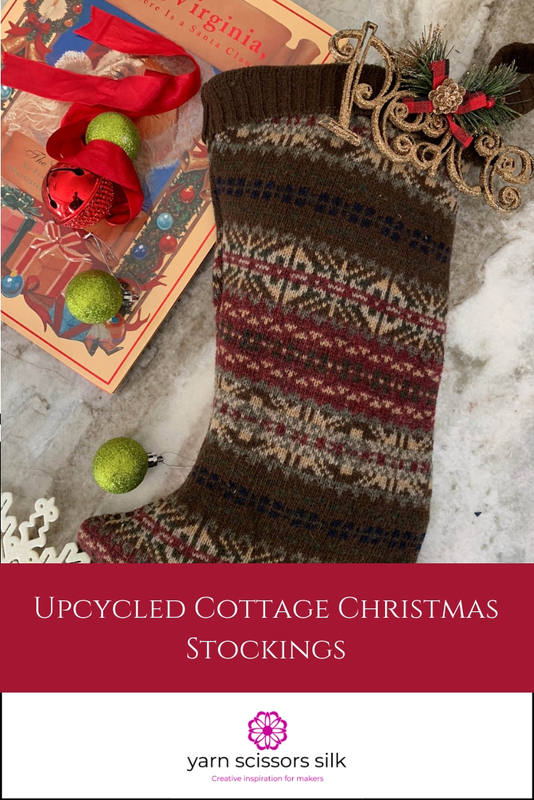 Try this super-quick and inexpensive solution to make woolen Christmas stockings from upcycled sweaters! I’ve been wanting to make some new Christmas stockings for a few years now. I still love my other stockings but wanted something a bit more rustic for my little Curtice Cottage this year. Two years ago I started on a needlepoint set of stockings but haven’t been able to find the time to complete them. So, I came up with an idea for a super-quick and very inexpensive solution to my stocking dilemma! I went to my local thrift store in search of some old wool wintery sweaters that weren’t in perfect shape so I wouldn’t feel bad cutting them up for my stockings. 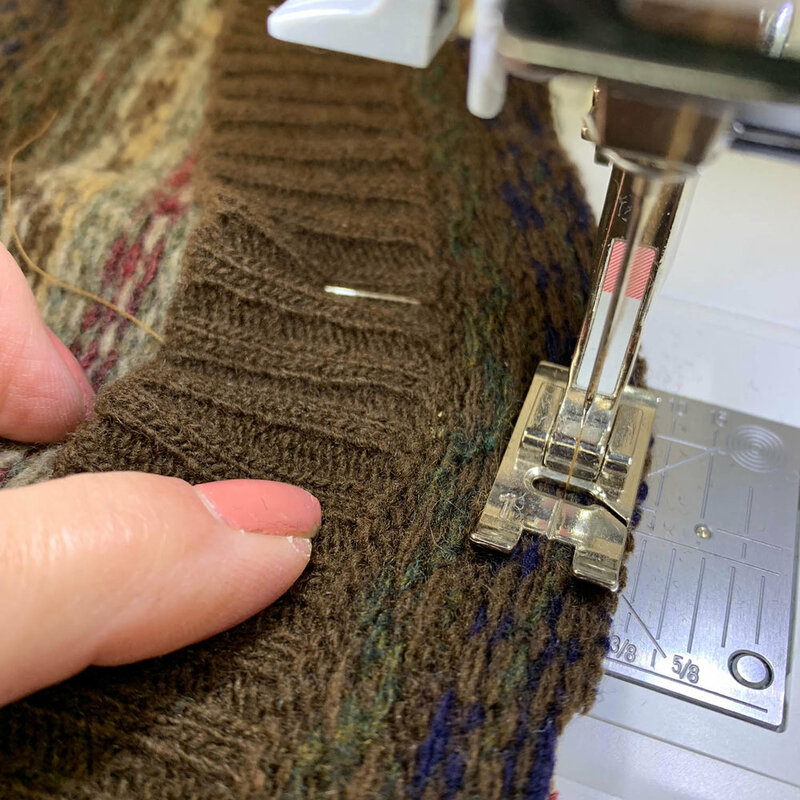 I found three great wool sweaters with wintery patterns-two of which had moth holes so I was careful to work around those areas. Each of these sweaters can make two stockings by using the front and back and having leftovers that could be felted or made into coordinating ornaments. I used my old stockings as a template since I liked the shape and size of them. Here’s how I did it! 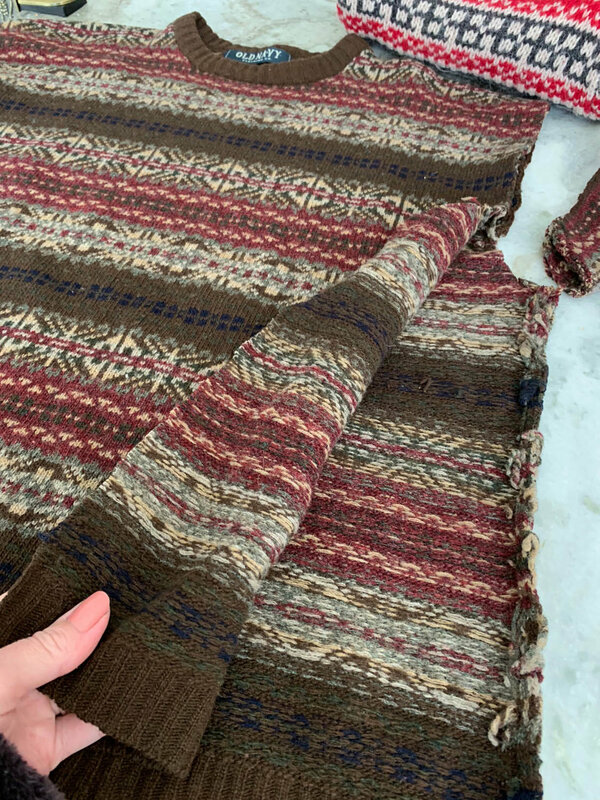 Cut off arms and top edging of sweater; don’t discard as you’ll be using these scraps for finishing. 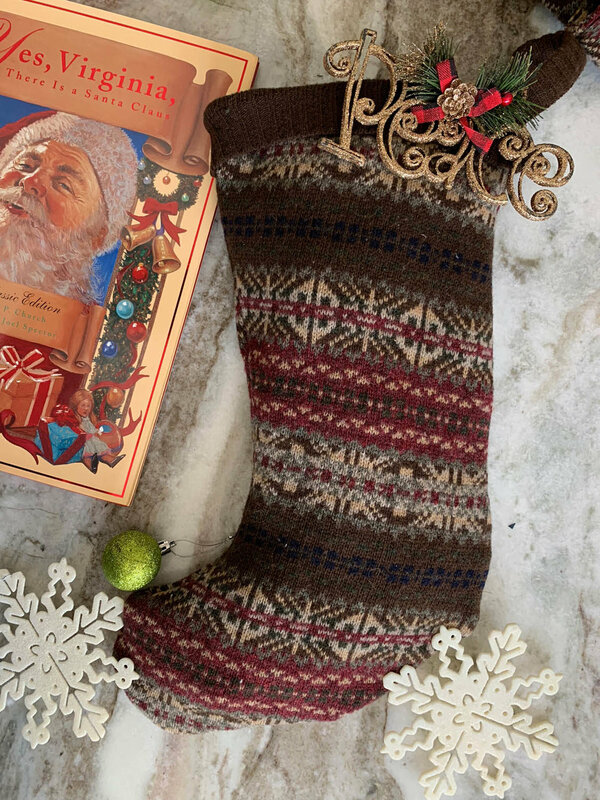 For the front of your stocking, place the pre-made stocking on your sweater with both the sweater and pre-made stocking right sides up, making sure to leave room for the other side of your stocking since you’ll need a front and back. Trace around this shape with a 1/2” seam allowance. Cut out stocking shape from a single layer of the sweater fabric. 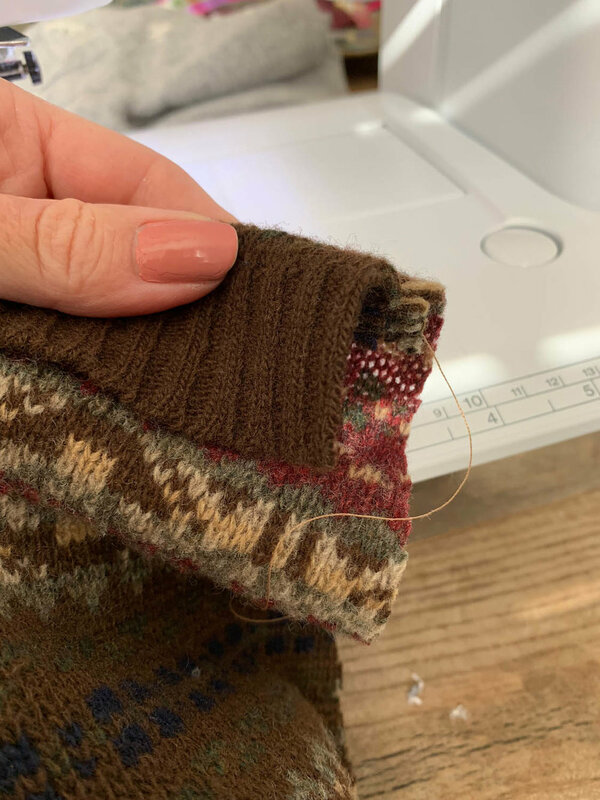 For the back of your stocking, place the pre-made stocking wrong side up on top of the right side of the sweater fabric; trace and cut as before. This way you’ll have a front and back with the correct side of the sweater showing. If there is enough sweater material left at the bottom of your sweater, cut off bottom cuff from sweater. You’ll use this for the cuff at the top of your stocking if desired. Pin stocking front and back together with right sides facing. Sew together using a 1/2” seam allowance. 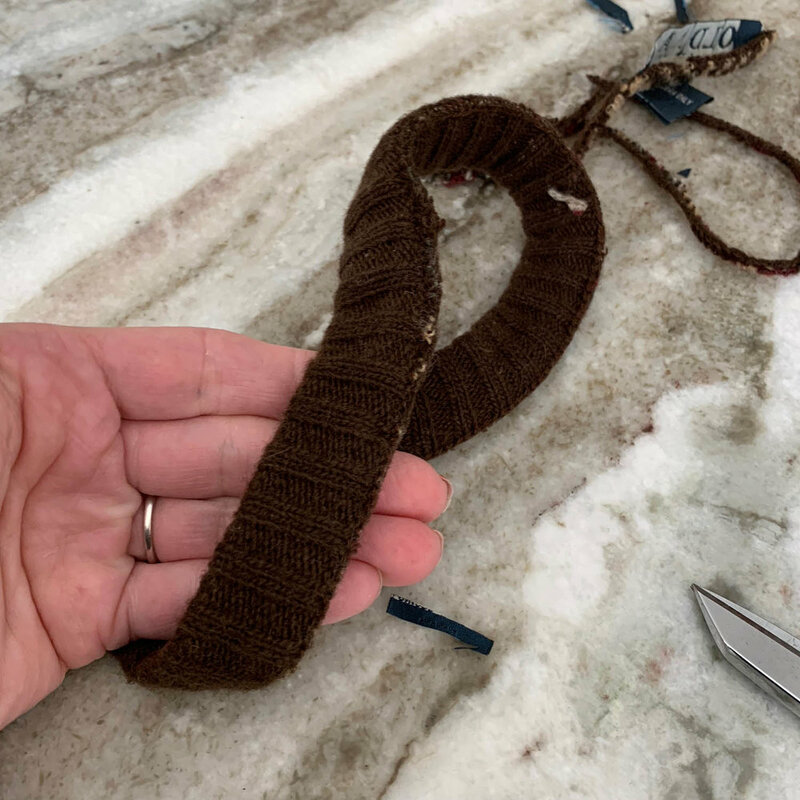 If you haven’t already done so, cut the narrower neckline ribbing into pieces long enough to use as a stocking hanging loops. Set aside. I’ve cut two for two stockings but you’ll only need one for each stocking. If you don’t have a piece left over, as I did, you can use a piece of ribbon or fabric for a hangar for the stocking. Now you’ll use the bottom of the sweater ribbing that you cut, and you’ll stitch it all around the perimeter of the top of your stocking. Note: It’s easy to get confused about which sides should be facing as you stitch. Study the photo above and make sure you’re pinning and stitching with the right side of your cuff to the wrong side of your stocking. 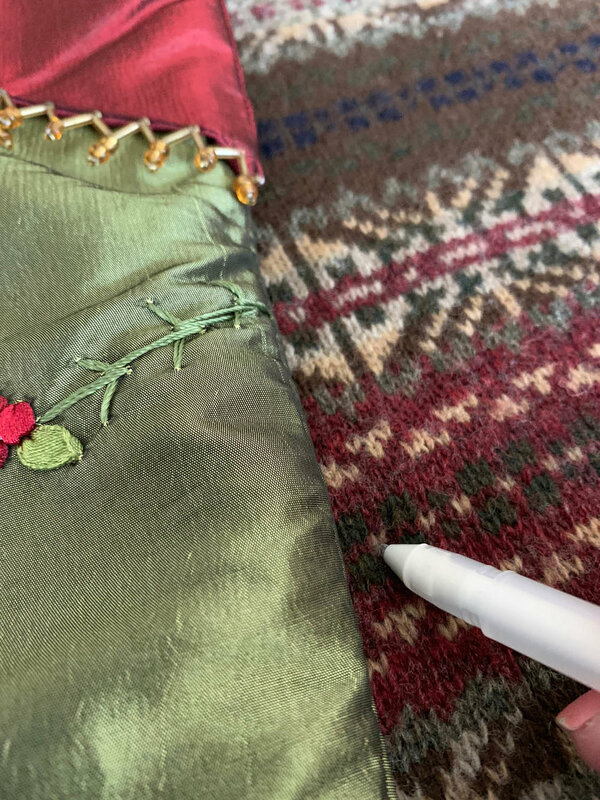 You’ll stitch the ribbing all around the top edge of the stocking, starting at the side of the stocking that it will be hanging from—see photo. When you get almost all the way around, you’ll stitch in the hanging loop so the ends will be hidden in the stitching. This gets really tricky with both the placement of the hanging loop and using your sewing machine to stitch through so many layers. If it’s too thick to go through your sewing machine you can hand stitch this part. Turn stocking inside out and hand press cuff in place. You may need to take a couple stitches around the cuff to hold down so it’s not flapping. Finally, if you’d like to add an ornament as I did, you can tie or attach as necessary to the side of the stocking. 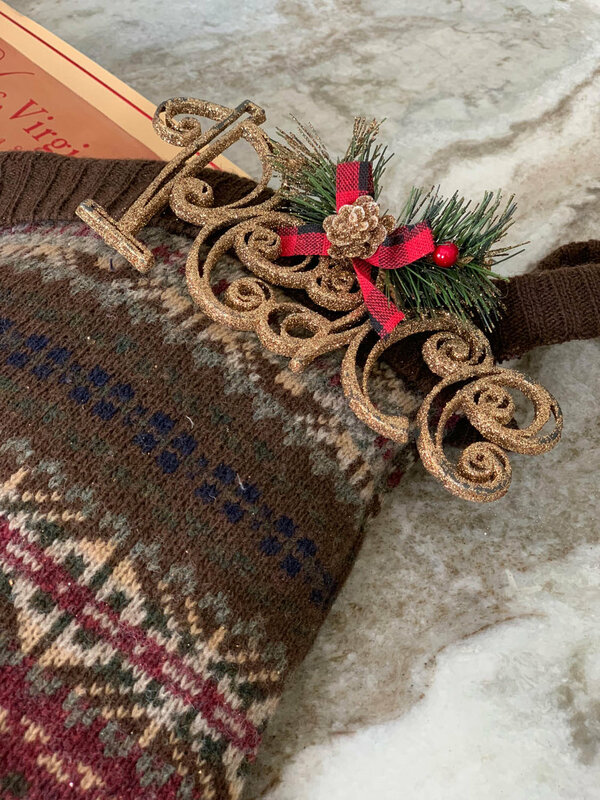 This cute ornament was from the dollar store and I loved the contrast of the dressy gold glitter with the rustic wool sweater! That’s it for your first stocking. I can’t wait to complete all of mine and now that I figured out the tricks of constructing it, it will go faster. The hardest part of this project is getting the right/wrong sides stitched together properly. Explore my other fun Christmas crafts!